There is a long dispute about whether airbags have saved more people then they have severely injured. Airbags began to be integrated by american automakers in the 1970’s. Airbag defects began to emerge soon after that. However, due to increase in car crash injuries and deaths, the U.S. government ordered automakers to include either an automatic seat belt system or drivers side airbags in their vehicles manufactured beyond April 1, 1989. In 1998, the National Highway Traffic Safety Administration ruled that all vehicles must include dual front airbags. Since then, thousands of lives have been saved in traffic accidents. There is no doubt that airbags have been invented for additional safety to drivers and passengers who face a car crash. Airbags safety problems have existed since they were created. Problems with the airbags include not being deployed during an accident, being deployed randomly for no reason or causing injury or death. In fact, airbags have been known to explode! However, this added protection have been the difference in some circumstances between life and death. The risks of being injured by an airbag are significantly lower than the risk of being seriously injured or killed in a traffic accident without the protection of an airbag. 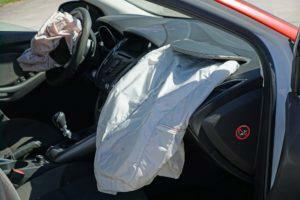 Airbags significantly increase the chance of surviving a car crash. If you have had a personal injury caused by a reckless individual, don’t suffer in silent and allow attorney Joe Ramirez and his team of professional legal experts to claim for the financial help you deserve. Call 956-4100-LAW or visit us at our local office in the Rio Grande Valley at 214 W. Cano St. Edinburg, Texas. We are here to help!